Thanksgiving is my favorite holiday—not yet commercialized, non-religious, and non-war related. It is a time for stopping and appreciating the many blessings you have. It’s a time for sharing the company of good people. It’s about gathering to share a bountiful meal. Who among us doesn’t have happy childhood memories of Thanksgiving smells, tastes, and gatherings filled with stories and laughter? It’s in our nature to want to belong to some group. Tribes and ethnic groups around the world are still fighting today to hold onto their identities and territories. Thanksgiving provides us a chance to appreciate all we have, including a sense of belonging to something larger than ourselves—whether it’s a traditional family, a group of friends, a community, or a global connection to others everywhere. This photo from a gathering this week illustrates the varied and loved groups for which I’m grateful. It’s a gathering of car/dog/beer lovers at Hal’s garage in Old Town Alexandria. 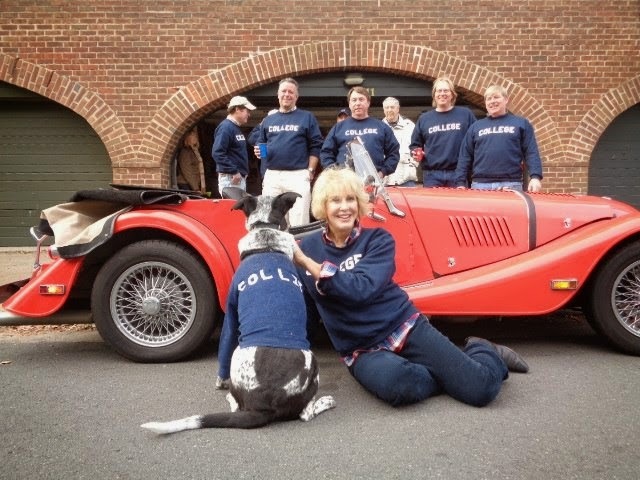 Many of us are wearing “college” sweatshirts a-la-Belushi, while my dog Elvis is sporting one that says, “collie,” since that’s what his dna test results indicated. I guess even Elvis is grateful this Thanksgiving for belonging to the garage gang and the collie breed. I hope you find quiet moments this Thanksgiving to count your blessings and share moments of communion with others. Happy Thanksgiving! What other things are you looking forward to? Many years ago, I sat next to a priest on a flight. We got chatting and I’ll never forget something he told me, “To be happy, people need something to look forward to, something meaningful to do, and someone to care about.” It’s easy for many of us to become caught up with reacting to the high-speed challenges life and work throw at us, especially during the busy holiday season sprinkled with deadlines. We can lose sight of these three essential elements to a rich and rewarding life. Many organizations are also reactive—their leaders fail to build commitment to shared goals, define and reward members’ contributions, and create a caring, results-driven culture. They never achieve their potential because they fail to follow the simple formula shared with me all those years ago. The steps organizational leaders can take to achieve these three elements are at the core of our work with organizations that want to improve. 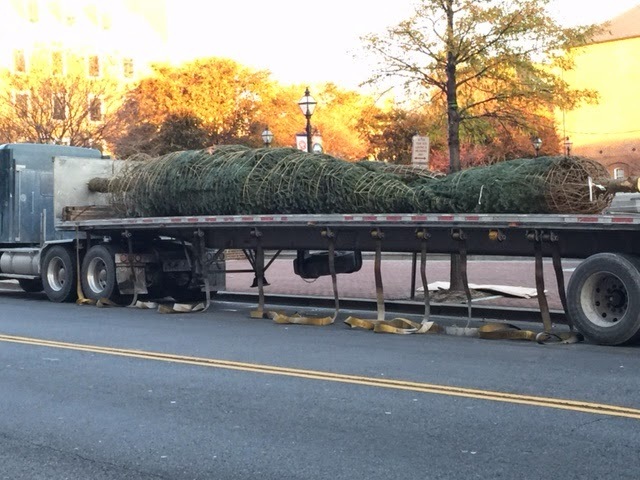 As I saw Alexandria’s Christmas trees being unloaded and set up in front of our city hall this morning, I was inspired to set some goals for the holiday season that build into my holidays the 3 elements the priest identified. I will look for ways not to be swept up by the superficiality and consumerism being pushed upon us. I will find meaningful ways to mark the holidays—and do so with people I love. I will plan with loved ones special moments we can look forward to. How about you? What steps can you take to make sure your holidays are filled with meaningful activities, shared with people you care about while giving you things to genuinely look forward to? By planning ahead now, you can ensure a happier holiday season for yourself and those you love. Are you on Facebook? How often to do you tweet or post to Instagram? Do you have your phone on the table while you eat dinner? Do you keep it within reach while you watch a movie together with your spouse? When did you last spend time in a waiting room without your phone or tablet? I have built my life's work on the concept that connectedness is everything. Connecting with others creates an authentic experience that enables us to appreciate and understand others and vice versa. Our connections lay the groundwork for the relationships that enrichen our lives so that we can continue to learn, grow, and share with each other. And these personal connections are essential because they ultimately provide the building blocks to healthy families, strong communities and productive organizations. Yet, while social media and technology provide ample opportunities for connecting with friends (and strangers) in an online context, I completely agree that there is a tipping point in their usefulness. After watching the video I've posted below, I realized how important it is for all of us to acknowledge the tipping point and help each other stay away from it. Think of the lost opportunities in unexpected places like waiting rooms when we stare into our phones instead of starting a conversation with a fellow patient who may offer us advice or a reassuring story. Think of how your children may misinterpret your level of excitement and appreciation of them during a school play when they see your phone's video blink staring at them instead of your reassuring smiling face. Isn't it amazing how 161 "happy birthday" posts on your Facebook wall don't hold a candle to one friend stopping by to share a glass of wine on your birthday? So take a moment to consider this message, delivered below in a different voice from mine, but with the same idea that connectedness is everything. When you get a chance, let me know whether you agree and send me any examples of when technology was used as more of an anti-social than social tool.